Interview with Kristina Astakhova / Alexei Rogonov about past season, continuation of their free program “Doll” and new short program. Guys showed themself as a creative skaters with interesting programs, so I think their interview might be interesting for those who likes figure skating. Here are also some great photos from thier photo session in style of their new short program to “Eugene Onegin”. And as a bonus – a video clip. This is second season of your joint performances. Was it easier or harder in comparison with the previous year? Kristina: This season turned out pretty difficult. The first one was a bit easier. But our coach warned us about this. He said that work on the pair elements – twists, lifts, throws will require patience and will take a long time. So it was happenning during the season. Something turned out, something didn’t. Nerves, anxiety. But, in spite of everything, we continued to work. It’s great that we performed at the European Championships. Last season we didn’t. Pity, that we didn’t go to the World Championships. Participation in any serious competition – it’s a big plus. It’s an experience emotions. Alexei: We were preparing very seriously for the World Championships, because there was a possibility that, as at the European Championship, will have to replace some of the leaders of our team. The whole month we were practicing, keeping the shape and relaxed only when it became known that all our previously declared pairs will perform in Boston. But in general, if we talk about our second season, I agree with Kristina, this year seemed to me more difficult. Difficult in the details. In getting used to each other. In the first year we did on the “impudence”, the main thing for us was to skate, to act, to show ourselves, but now we to use head, to pay more attention to each other. Naturally, our techniques is different and it was necessary to find a “common denominator”. In addition, our coach Artur Dmitriev. promotes some his ideas that need to be taken. Precision work was carried out continuously, and it really took a long time. In this case it’s easier for experienced pairs, they have been skating together for 5-7 years, we’re – only the second season. So, we had a double task. But let’s see how it will be in the following year. In any case, Kristina and I will try to keep the level, which was set by the previous two seasons. Last year, you also did the short program very early and showed it to the public in May. Alexei: That performance at our rink wasn’t really well prepared, but still we tried, how the audience will accept new program. At that time, we had a good shape, so why not to skate? In past season you also had interesting programs “Artist”, “Doll,” “Master and Margarita”, now you’re going to do classics – “Eugene Onegin”. Whose idea is it? Alexei: Our choreographer Sergei Komolov brought the music. And when we heard it, no one had any doubts. Kristina: How is it, it wasn’t any doubts? Music is really strong and beautiful, but the musical’s “Eugene Onegin” is in Russian. Therefore, we have begun to doubt how the public at the international competitions will accept it? But then we agreed that most viewers probably knows this story. 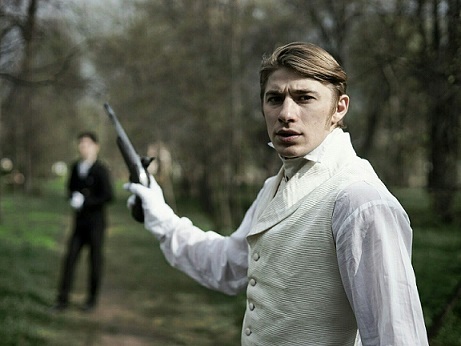 We came across some great shots, where you and Kristina in costumes of Pushkin’s era. Alexei: I will tell you a little secret. We shot a video, to make a trailer for our short program. Nodari Maisuradze was in the role of the operator. We chose a place, shot quickly, because theatrical costumes had to be returned. But while the video is in editing, we shared some photos. By the way, the idea of ​​trailer is great. 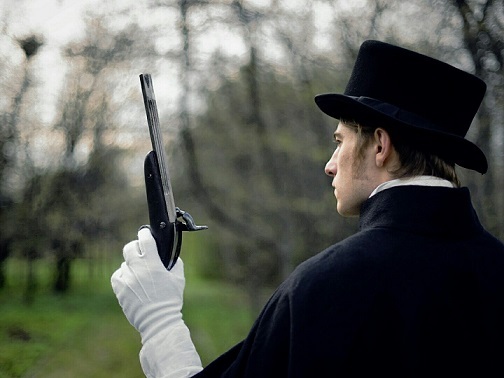 Have you seen the musical “Onegin”? Did you like it? Kristina: It’s really cool. Sitting in the audience you have a goosebumps from the music and voices of performers. Alexei: We have seen it, and more than once. Awesome voices, powerful music, the orchestra – all it’s live. Beautiful scenery, lights, stage design……Before I treated musicals a little skeptical. It seemed to me as something “poppin”. But when I looked “Onegin”, completely changed my mind. I want to see “Master and Margarita” and “Vampire’s Ball” with the participation of this troupe of actors. Honestly, I’m unsentimental man, but watched and listened “Onegin” with bated breath. Kristina: Of course, the work of Pushkin quite extensive, it’s difficult to fit it in the short program, so we chose a few key episodes – Tatyana’s letter; drama when heroine asks Onegin to save her and the events on the eve of the duel with Lensky. Alexei: We had to compress the plot, and Sergei Komolov expertly picked the needed musical parts. Didn’t you want to make “the two-part story”: free program – a continuation of the short, as Denis Ten did? Alexei: In terms of the amount of the music, we would have enough music parts for several programs. But in relation to free program we already had a different idea, which in some ways echoes what you said. We haven’t started the creation of the free program yet, but we know for sure that new free program is a continuation of our last season’s program. Alexei: You can say that. Many liked our free program, and at first we wanted to keep it for the next season. But in order to grow further you need to constantly change, do something new, so the idea of a sequel was born. I think that in pair figure skating there wasn’t such a precedent, so we will be the first. In technical terms, will you enhance the program? Alexei: We’ve just made a short program, we haven’t thought about elements yet. Just kidding. Of course, we will have a new lift. According to the requirements of the next season we will change rotation, death spiral … From throws we’ll keep flip. Regarding the jump is too early to say anything. Will see whether or not to risk and put another jump, different from ours salchow. But I want to say that, perhaps, for the first time in two years, our new short is made in such way that we have time to finish skating with the music. Last season, we were constantly late in short program. All year were chasing these seconds! But apparently, our choreographer calculated everything and thought out to the smallest detail with the placement of elements, and we also improved in speed. In pair skating it is very important to execute the elements on a speed, that is what our pair is lacking. We know about our disadvantages, what we lack, because as long as there is no perfect synchronization, and during the execution of some elements – an absolute certainty. But with time everything will come. We improve gradually. How do you think, is it possible to make up the missing points by a second assessment if not to make the program more difficult technically? Kristina: Many pairs already do quadruple twists, throws. Naturally, that with such elements of ultra-difficulty it’s unlikely to catch up them only with the second mark. Alexei: Competitions show that whatever we do in the interpretation of programs, no matter how bright and emotional may be characters, music, but it’s impossible to win only with the second mark. In any case, you have to make some complications. It’s a big sport, and pair skating moves forward. To win, you have to be a cut above rivals on everything. Then a question: are you going to do such elements? Alexei: In our case, taking into account height, weight, the most real is quad throw, a twist – it’s more difficult. The twist can be done triple, but cleanly and on plus. But the throw…Before putting a quad throw into the program, it is necessary to do a triple perfectly. We are working, but not forcing. Kristina: Any quadruple element – it’s fear. And above all, you must to overcome yourself. We do a quad throw in a gym. But it’s on the floor. What will be on the ice, yet difficult to say. I really enjoyed their last season’s programs.I’m glad to hear,that they have chosen classics for this season.I like very much classics,there are a lot of moments to interpret in skating. Can’t really understand why some skaters choose ’50 shades of grey’.To me it’s not a good “taste”. Oh,I see.Then it will be even more interesting!By watching figure skating I always can learn something new.